Doing something you love is something you rarely do consciously. When you get downtime, maybe you think to yourself ‘oh I’ll paint’, or ‘oh I’ll make a coffee”, “I’m going to cook today”, “I am going to take some awesome blog photos!”; they’re always things you just sort of do when you get a spare five minutes. I am terrible at – but really love – art. I’ve never done much about that, I buy sketchbooks, try and paint and get frustrated when the (beautiful) scribbles hanging on the fridge from my nieces and nephews manage to look like something which belongs in the National Portrait Gallery vs my messy, disproportionate figures and etchings. Still, I’ve always found it relaxing and, at the end of last year, my sister coerced me into joining an art class with her – which was something I never would have done by myself! As a side note, my councillor has been trying to encourage me to go out more and do things surrounded by other people. Which, as you can imagine, is always firmly met with a half-smile and nod of the head, only for her to give me a rather knowing look. Anyway, S and I signed up to art class, and my Mum decided to join too! It was not the type of class I expected. It was way better! The majority of the art we do can be done either freehand or using the transfer method – you might remember this from when you were a kid; you draw around a print out of something, pressing quite hard on your pencil, flip it over, and ‘scribble’ hard using the side of your pencil. It’ll leave a faint trace of what you want to draw, which you can then fill in and freehand in more detail. Art class is actually a franchise; set up Jenny Miazels (check her out on Instagram here) and there’s a whole series of terms which you can do. All the materials are provided – and so are wine, tea, chocolate and crisps – hurrah! 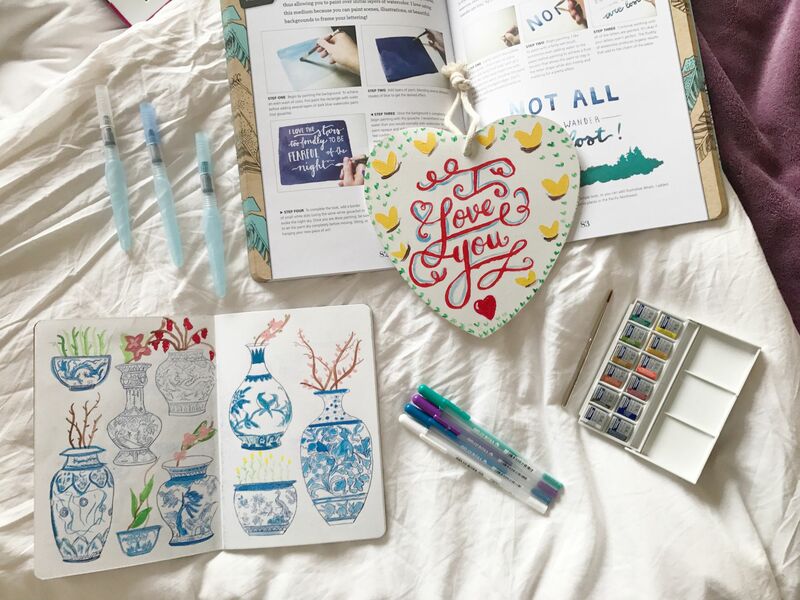 We’ve covered some awesome stuff in art class so far – we started with cuckoo clocks, moved on to Ming vases and even painting our very own heart plaques just in time for Valentines day! It’s always easy to neglect doing what we love, what makes us feel happy, but I can honestly say the two hours I’m holed away in art class, I turn my phone off and concentrate. I really ummed and ahhed about whether or not I should attempt this tricky font on the plaque for fear of messing it up- even using the transfer method, but I’m so glad I did! It’s now hanging on my door, as a happy reminder, that its always worth spending time doing something you love. Ohhh this post makes me so happy! 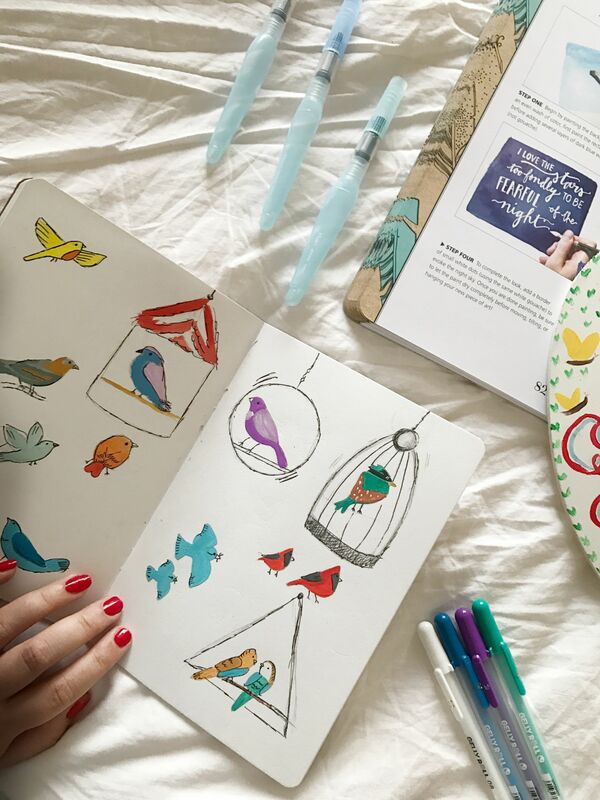 I love seeing the things you create at art class, the bird paintings are absolutely gorgeous! I’m so glad you’re enjoying the class so much, and it must be such a lovely thing to do as a family too. 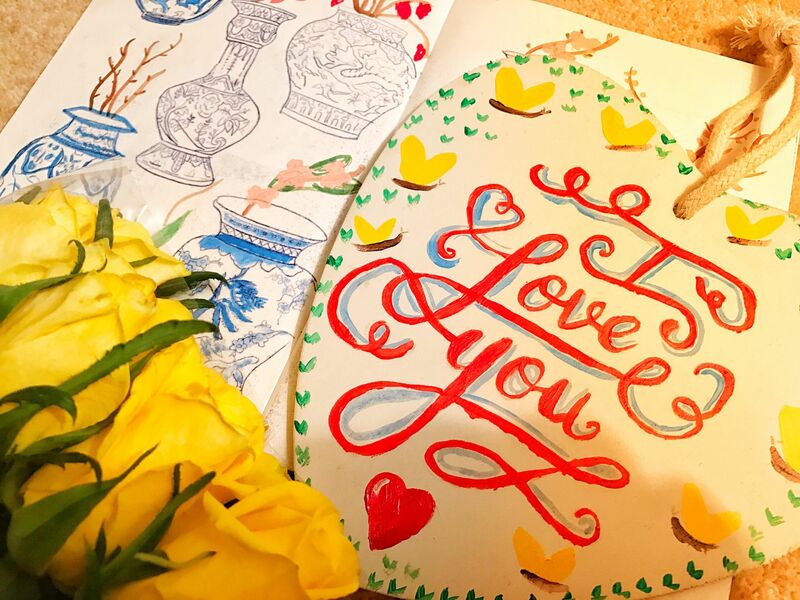 And you’re right, I was fed up of being bombarded with SO many emails about Valentine’s, so it’s lovely seeing a post about something you love! Speaking of loving things… LOVE YOU. Yaaay! I’m so glad you like seeing them! The bird paintings were so nice to do 🙂 and haha I know, I am pretty indifferent about Valentines day but I felt totally SPAMMED this year! Madness! I can definitely echo what Hels has said above about this being a fantastic take on a Valentine’s Day post, I love it! Seeing your arty photos every Wednesday always puts a smile on my face, you do create some gorgeous things! The fact that there’s plenty of wine and biscuits to go around means I’m totally sold on these classes hehe! So glad you are managing to reconnect with something that you love so much! Awww thank you! You guys are the SWEETEST <3 hahaha. The biscuits really draw me in every time and you know I'm never one to turn down a good vino! Glad to hear you’re enjoying the art class! It sounds like really good fun. Your drawings are fab too! I love art, haven’t been to a gallery in ages. I do enjoy picking up my sketchbook from time to time. I’m trying to get more creative with my bullet journal too. I think you did an amazing job! I always love seeing art creations! You have such an amazing talent! I’m loving this post so much, glad that you’re enjoying yourself! Aww thats so sweet! I can honestly put it all down to the transfer method, my free-hand is awful! Happy you’re taking the time for something you love, it really makes a difference. This year, I’ve really been focusing on me time and doing the things I want to do and I’m loving it. It totally does! It makes so much difference having that little bit extra ‘you’ time for stuff that makes you happy! It’s awesome Adel, I totally recommend it! This looks like so much fun!! I’m the same as you – I love to get paints and pencils and everything out and I can sit there for hours being creative, even if I’m not very good. It’s still cool to see what everyone’s styles are like, even if they look like they’re done by 10-year-olds! 😀 Your art is so adorable, by the way – I love it! This is such a great Valentine’s post. It is so important to take time out for yourself and doing things you enjoy and love!